The main factor you will be shopping by when picking out a grow tent is the lighting system you will be using. 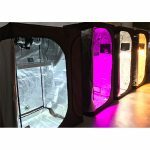 Choosing a grow light for your grow tent kit is easy! Take away the stress, leave the headache for another day, and set yourself up for gardening success with our complete grow tent kits. 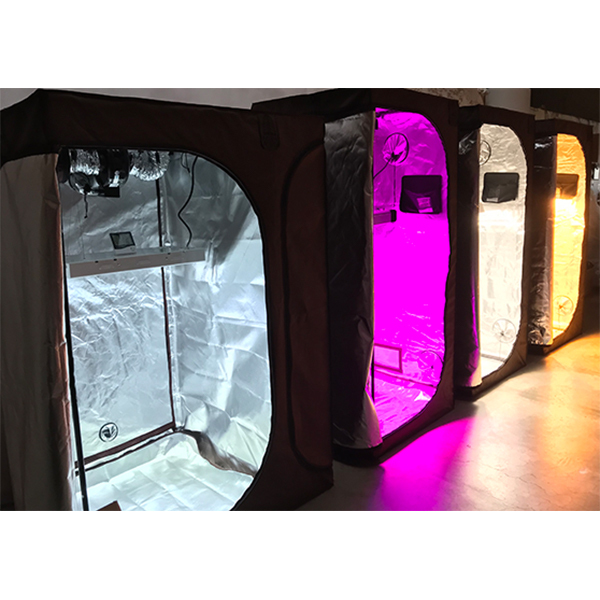 All of our grow tent packages include grow tents, grow lights, ventilation, and more. That’s right, our grow tents come with lighting packages that not only come with your choice of grow light - HID, CMH, LED, and Fluorescent - but come with every component you need to get them up and running. Our grow tent packages are designed so you can make one purchase and have everything you need to go grow from seed to harvest. Our tents come in sizes that will comfortably fit in your closet, all the way up to ones that fill your garage. Whether you’re a new gardener that’s looking to start your first grow or a pro that’s looking for a change, at Hydrobuilder we’ve got you covered. Soil - All kits come with plastic saucers and premium nursery pots (3 gallons). Hydroponics - All kits include either one of two Deep Water Culture systems. Hydroponics Upgrade - Some of our larger grow tent kits allow you to upgrade to a bigger DWC system. All of our grow tent packages include: grow tent, lighting & timers, ventilation, pots/containers, nutrients & tools (optional), CO2 (optional), and propagation kits (optional). All kits work with a standard house plug. Instructions for easily setting them up. Every lighting system comes with unique issues that make them difficult for newcomers. That’s why we designed and customized each of our kits so newcomers can easily jump right into using them and won’t have to worry about their learning curves. Want to learn how to set up your grow tent? Check out our grow tent setup guide! The light intensity/wattage of the grow lights will vary depending on tent size to create an optimal lighting footprint and promote maximum plant growth. What beginner doesn’t want to use the lights that most professional use? Unfortunately, many new to gardening are put off by growing with HID grow lights because of the extra components needed just to use the lights. On top of that, they then have to worry about setting up a great ventilation system to combat all the heat the lights generate. Once you figure out everything you need to set them up it’s smooth sailing. That’s why our grow tent kits figure it all out for you, so all beginner can grow like the pros. HID grow tent kits can be broken down into single ended (SE) and double ended (DE). This is a variation in HID lighting, and there are a few things you should know. SE grow lights are great for beginners, produce less heat, and feature a standard Edison type bulb screw in. DE bulbs attach at both ends of the fixture, produce more heat, but generate way more powerful light. If you have the space and are capable of combating heat, a DE grow tent kit will outperform an SE counterpart. The majority of our HID grow tent kits come with both HPS and MH lamps. This will give you the best light spectrum for all growing stages. For those on a budget, we offer smaller size tents that come with a HPS lamp, which is the recommend HID lamp to use for all growing stages if you can only afford one type. Grow Light - Reflector/hood, ballast, HID bulb(s), light hangers, and a dual outlet light timer. Ventilation - Inline exhaust fan, carbon exhaust filter, fan speed controller, clip-on circulation fan, ducting with clamps, and a thermo-hygrometer. Grow Method - Trellis netting, trimming shears, and your choice between a soil or hydroponic setup. LEDs are taking home grower's grow rooms by storm and have their eyes set on commercial operations next. Figuring out the best LED lights for light spectrum, PAR, etc. is often too much to learn at first, so we made sure to choose LED panels that give gardeners an LED grow light that works great for all growing stages, and is fitted for the grow tent giving growers the best lighting footprint. Grow Light - LED panel, light hangers, and a dual outlet light timer. Make sure to check out our multi-chamber tents that come with an additional CFL grow light for the smaller propagation chamber. Ceramic metal halide grow lights are one of those lighting systems that pays for itself after some time. When they do, you have a wonderful lighting system in place. The high set up cost and unfamiliarity can care new growers. That’s why we designed our kits to perfectly fit your needs. Unlike HID lights, with CMH's you won’t struggle with heat, nor will you have to replace the bulbs anywhere near as often. Ceramic lights are brilliant for beginners as they offer a huge advantage that most other grow lights simply do not. They don’t color your plants when the lights are on them, and this makes judging plant health and spotting issues incredibly easy. Grow light - CMH or LEC grow light fixture, light hangers, and a dual outlet light timer. Grow methods - Trellis netting, trimming shears, and your choice between a soil or hydroponic setup. Fluorescent grow lights are a very popular choice for growing plants during their vegetative and seedling stage. The T5 fluorescent fixture offers a brilliant light spectrum for vegging plants. These are also incredibly efficient, and avoid stressing the plants with heat and light. Our fluorescent grow tent kits offer a simple setup to start your indoor grow off on the right foot. Fluorescent lighting features longer lasting bulbs that provide a lot of light without running up your electric bill. With these tents we wanted to keep it clean and simple, that’s why we only offer soil pots and saucers for our fluorescent tent packages. Make sure to check out our multi-camber tents that come with an additional CFL grow light for the smaller propagation chamber. Grow light - T5 fixture, light hangers, and a dual outlet light timer. Ventilation - Duct fans or exhaust fan & filter, fan speed controller, clip-on circulation fan, ducting with clamps, and a thermo-hygrometer. Grow methods - Trellis netting, trimming shears, nursery pots, and plastic saucers. Which grow light is best for your grow tent? At the end of the day, you are the determining factor in which grow tent kit you choose. Your experience level and budget will play into this, but regardless, you will be able to cultivate strong, healthy plants. We have a ton of resources for those new to growing in a grow tent, and we recommend you start with viewing our full grow tent kit category. There is some really good information there, and you will be able to shop by light type, size, growing method, or type of tent. We carry brands such as Covert, Gorilla Grow Tent, and Secret Jardin. If you want help selecting a grow tent, reach out to our expert growers at 888-815-9763.